Although on the face of it picking your holiday on the basis of what happens to the water once you have flushed it from your hotel bathroom might seem a bit of an odd way to go about things, from an environmental perspective, it does make sense. Water itself is a scarce resource in many parts of the world – and tourists invariably use more of it than the local population in the first place. Where it goes and what becomes of it – and the bodily wastes it carries away – can be an important consideration, particularly given the potential it has to cause environmental pollution and spread disease if it is not dealt with properly. It may seem a slightly unsavoury topic, but it is certainly worth thinking about – even if few travel companies are in a hurry to highlight sewage treatment arrangements in their brochures! One very useful indication of how wastewater is treated comes from the Blue Flag Scheme – the definitive yardstick for beaches since it began back in 1987. With a highly effective monitoring system and 27 separate requirements to be met before it is awarded – including strict rules on water quality and environmental management – it must be applied for each year, which ensures high standards are maintained. Monitoring is continued throughout the season and the award will be withdrawn at once, if the beach’s quality is found to have dropped. 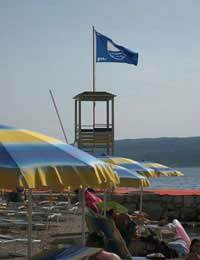 Originally this was a European scheme, but in 2001 it was extended initially to South Africa and currently, over 3200 beaches and marinas in 37 countries across Europe, South Africa, Morocco, New Zealand, Canada and the Caribbean have Blue Flag status. If your intended destination is one of them, you can safely relax. The issue is not simply one of human health and hygiene. There is growing evidence of the damage that improperly treated wastewater – and sewage especially – can cause serious problems for living coral reefs. The nutrients in sewage provide fertiliser for algae, which stimulates them to grow rapidly, often covering the coral and making it increasingly difficult for them to survive. In addition, the salinity of the water can be affected and excess silt produced which changes the character of the local coastline, with potentially wide-ranging impacts on the marine habitat and its inhabitants. This problem is particularly relevant to the Caribbean, since hotels and resorts operate around half of the wastewater treatment plants in the region and studies have shown that perhaps as many as three-quarters of these do not provide adequate basic treatment. According to the Caribbean Tourism Organization (CTO) some 85 per cent of the sewage generated by the region’s hotels is inadequately treated and ends up being discharged to the sea from short outfalls, often 100 yards or less offshore. Unfortunately, the situation is compounded by weak regulations to control sewage disposal and the agencies responsible for monitoring and enforcing the standards being largely under-resourced. Researching how coastal hotels in this part of the world – and elsewhere – treat their wastewater is not easy, but with persistence and a bit of luck, it can be done. If you are taking a specialist eco-holiday, there is a good chance that your tour operator or travel agent will have all the answers for you, but if not, then you may be much more on your own to find out. That does not mean it cannot be done, but it may be a time consuming process, since not all resorts or hotels are quite so transparent and forthcoming on these matters as you might wish. Wherever you intend to travel, to be really sure about the wastewater arrangements, you are probably going to have to get in contact with the relevant tourist board and almost certainly even the hotel or resort itself. The local water authority can often be another good source of information – and most have very user-friendly websites these days, so you do not have to be an expert in sewage treatment to begin to get a meaningful insight. If you are thinking about holiday plans it is not often that worrying about wastewater arrangements features high on the list – though once you have started to think about it, it is almost impossible to stop. There are, of course, perfectly sound environmental reasons why you should consider it, every bit as much as your carbon cost or your energy usage, but in the end, it really comes down to something a good deal more personal. None of us really wants to see that sort of pollution floating by, just in front of our noses, in an otherwise beautifully blue sea.